Power adapter (EADP-38EB A), USB Cable, Stereo Mini Cable and DVD-Rom (Cubase AI). Features YAMAHA THR 5 Battery or Power adapter. Weight: 2 kg. Abbastanza piccolo da poter essere posizionato su una scrivania piena o nella valigetta!Sviluppato da un team di chitarristi alla ricerca del suono migliore, THR produce il suono che si desidera e il tocco di cui si ha bisogno. Features YAMAHA THR 5: 5 Amp Simulations (Clean, Crunch, Lead, Brit HI, Modern). Power adapter (EADP-38EB A), USB Cable, Stereo Mini Cable and DVD-Rom (Cubase AI). Ein völlig neues Elektroakustik-Gitarren-Erlebnis - Der THR5A ist speziell ausgelegt auf elektroakustische Gitarren und Yamaha Silent Guitars. Dank fortschrittlicher Yamaha Modeling-Technologie simuliert er klassische Röhren-, Kondensator- und dynamische Mikrofone. Effekte, passend zu Ihrer Performance, kombiniert mit raumfüllenden Reverbs und Delays, katapultieren Ihren Sound auf das nächste Level. Im Gegenteil: der THR passt sich Ihren Voraussetzungen an - auch wenn Sie es mal leiser angehen lassen. Yamaha THR5A Gold Edition - Akustikgitarren-Verstärker. - Bestückung: 2x 8 cm Full Range Lautsprecher. - Betrieb mit Batterie oder Netzteil. - Effekte: Kompressor, Kompressor/Chorus, Chorus, Flanger, Phaser, Tremolo, Delay, Delay/Reverb, Hall/Reverb, Spring/Reverb. Yamaha THR5 Gitarrenverstärker. 1x THR5 Amp. 2x 8cm Full Range Lautsprecher, Leistung: 2x 5 Watt. 2x 8cm Full Range Lautsprecher. Effekte, passend zu Ihrer Performance, kombiniert mit raumfüllenden Reverbs und Delays, katapultieren Ihren Sound auf das nächste Level. Der THR5A ist speziell ausgelegt auf elektroakustische Gitarren und Yamaha Silent Guitars. Dank fortschrittlicher Yamaha Modeling-Technologie simuliert er klassische Röhren-, Kondensator- und dynamische Mikrofone. Yamaha THR5A Acoustic Gitarrenverstärker. Der THR5A ist speziell ausgelegt auf elektroakustische Gitarren und Yamaha Silent Guitars. Dank fortschrittlicher Yamaha Modeling-Technologie simuliert er klassische Röhren-, Kondensator- und dynamische Mikrofone. Yamaha THR5 Gitarrenverstärker SET inkl. 5 Amp Simulationen (Clean, Crunch, Lead, Brit HI, Modern). Effekte, passend zu Ihrer Performance, kombiniert mit raumfüllenden Reverbs und Delays, katapultieren Ihren Sound auf das nächste Level. L’amplificatore Yamaha THR5A è ottimizzato per essere utilizzato con chitarre elettrico-acustiche e silent. PERMUTIAMO IL TUO USATO ANCHE A DISTANZA! Virtual Tube Illumination. Chorus, Flanger, Phaser, Tremolo, Delay, Delay/Reverb, Spring Reverb and Hall Reverb effects. 2 x 8cm full-range speakers. USB connection. THR Editor. Now the THR5 has been upgraded version 2, with an even better sound that defies the convention that sound quality has to be sacrificed in a small amp with a small sound. Connections: INPUT (Standard Mono Phone), PHONES (Standard Stereo Phone), AUX IN (Stereo Mini), USB. The THR5A is optimized for use with acoustic electric and silent guitars. THR's design provides stereo playback from your smartphone or other device through its AUX jack or direct from your computer via the USB connection. Specifications - Yamaha THR5. Guitar Amplifiers. Guitar Accessories. Guitar Cables. Guitar Care. Guitar Picks. Guitar and Bass FX. Keyboards / Piano. THR5A is optimized for use with electric-acoustic and Silent Guitars. Connections: INPUT (Standard Mono Phone), PHONES (Standard Stereo Phone), AUX IN (Stereo Mini), USB. Amp Type: CONDENSER, DYNAMIC, TUBE, NYLON, EG CLN (Mic simulation). The Yamaha THR5A 10-Watt Modeling Combo Acoustic Stereo Amp is a desktop modeling guitar amp that simulates four different microphone types and is specifically designed for use with electric-acoustic and silent guitars. The Yamaha THR5 10-Watt Modeling Combo Stereo Amp is a portable 10 watt guitar amplifier with built-in amp modeling, effects and tuner. The Yamaha designed speaker enclosure has been optimized to handle both guitar from its 1/4" input and stereo playback from its 1/8" auxiliary input. 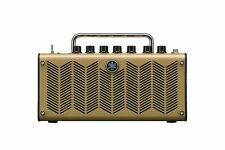 Please review the full item description of item "YAMAHA GTHR5UK 5W GUITAR AMP - Cream" for all information regarding delivery and technical specifications. TITLE: NEW YAMAHA THR5. ACCESSORIES: 1 PICK FOR FREE. CONDITION: NEW. Number of Models Amp Modeling Manufacturer Part Number. Please review the full item description of item "Yamaha THR5A - Electro Acoustic Guitar Amp" for all information regarding delivery and technical specifications. The built-in chromatic tuner features accurate, stable tuning and an easy to read display. Yamaha THR5 Guitar Amp. Incredible tone. Outstanding effects. Unbelievable stereo playback sound. Now you can have an amp with all this and which is small enough to fit on a crowded desk or in your carry-on luggage. Model：THR5. Condition : NEW. ― ― ― －. This is the amp to overturn the common sense that at the expense of small amplifier small sound = sound. Yamaha Integrated Amplifier (Black) YAMAHA A-S801B. Yamaha Integrated Amplifier (Silver) YAMAHA A-S801S. Literally like new, no defects.. included original box and cables! 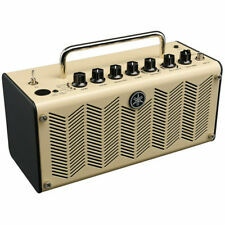 Yamaha THR5 THR5A Portable Guitar Amplifier Amp. Colour: beige. Date First Available: 1 Nov. 2011. Spread the fun of electric acoustic guitar unique. Yamaha (Yamaha). Amplifier for electric acoustic guitar sound specialized for acoustic guitar sound. Realistic guitar sound and Yamaha's hi-fi audio sound. Hifi stereo sound on compact body. Middle East. Amp to overturn the common sense to sacrifice a little amp small sound = sound. Equipped response with a tube amplifier, excellent effects, a hi-fi stereo sound in a compact body. 5 kinds of newly developed VCM amplifier type and a realistic guitar sound by Yamaha high-end mixer inheritance of the effect, to play in this single high-fidelity audio sound proud of Yamaha. THR5 compact guitar amp. Expedite : EMS. Warranty period is complied with manufacuture regulation. Condition : NEW. Back to top. We could receive bulk order, so we would appreciate if you could consult us! R amplifier THR5A. Electric acoustic guitar amplifier that specializes in acoustic guitar sound. YAMAHA Electric acoustic guita. And the guitar sound realistic, hi-fi audio sound proud of Yamaha. Yamaha (YAMAHA). Spread the fun of electric acoustic guitar unique. Warranty period is complied with manufacuture regulation. Back to top. We could receive bulk order, so we would appreciate if you could consult us!